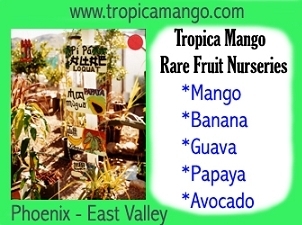 Growing Tropical Flowers and Fruits in the Phoenix Arizona, and California deserts. 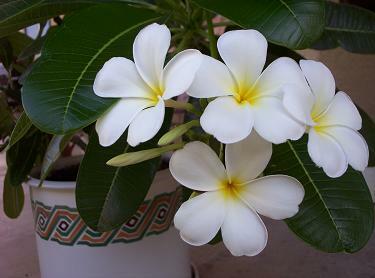 Plumeria cutting. Learn about growing exotic and not so exotic plants in the AZ desert such as bananas, lemon grass, guavas, mangoes, white sapote, papayas, plumerias, peaches, orchid trees, citrus, loquats, avocados, pineapples, hibiscus, tropical birds of paradise and more. This gardening site is dedicated to sharing information I have gained over the years from personal experience, lots of reading, and from fellow enthusiasts. The focus here is to provide regional information on a few select varieties that are of particular interest. Mostly importantly, to answer the question "Will that plant actually survive and produce here?". Often the answer to that question is surprisingly "Yes". Although sometimes the answer is that your plant has a better chance of surviving a trip through a wood chipper. This site is expected to continue to grow over time and may not initially contain information on every plant listed in the heading. Links to other sites are generously provided in the footer of many of the pages to give you a chance to expand your knowledge elsewhere. You will find these links particularly interesting if you are looking for a more scientific treatment of the subject. However, keep in mind that most of these links will lead you to information pertaining to plant care either on the California coast or in Florida. The menu bar up top can be used to navigate around this site. Some additional shortcut links are provided below to allow quick access to sections featured more deeply within the site. So, put on the salsa music, make a margarita and start thinking tropical. Phoenix Tropicals is a proud member of the California Rare Fruit Growers Club.